It is easy to learn Zhineng Qigong. It is for everyone irrespective of age or health status. Empower yourself with a framework of self-health management and personal transformation to attain your intention for balance and health. 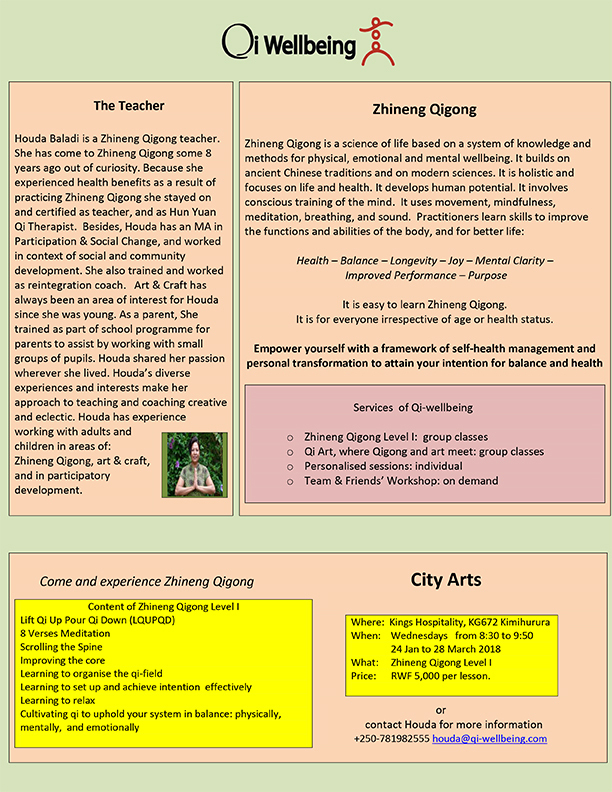 Houda Baladi is a Zhineng Qigong teacher. She has come to Zhineng Qigong some 8 years ago out of curiosity. Because she experienced health benefits as a result of practicing Zhineng Qigong she stayed on and certified as teacher, and as Hun Yuan Qi Therapist. Besides, Houda has an MA in Participation & Social Change, and worked in context of social and community development. She also trained and worked as reintegration coach. Art & Craft has always been an area of interest for Houda since she was young. As a parent, She trained as part of school programme for parents to assist by working with small groups of pupils. Houda shared her passion wherever she lived. Houda’s diverse experiences and interests make her approach to teaching and coaching creative and eclectic. Houda has experience working with adults and children in areas of: Zhineng Qigong, art & craft, and in participatory development. For adults and kids (12 & up). Saturdays 4.00 – 5.00 PM. Please bring your own mats. Pilates mat workout is about lengthening, strengthening, tightening and toning. The focus is on your core but Pilates works every muscle in your body. The class works on many levels so that everyone from beginner to advanced can get a great workout. Vinyasa is a term used in yoga to describe the act of ‘placing carefully’. This class will always be a little different with something new for all students. You can expect to be led through a flowing practice that weaves sun salutations, slow and faster paced poses and transitions into a moving meditation. This is a 90-minute class that is suitable for students who have some yoga experience. Start to sway? – Dancehall is a form of Jamaican street dance as well as a music genre. It’s a laidback dance, inspired by all-day-life, but requires attention to accents and control of movements. It is based on slow and sensual then fast movements, with pelvis’ rotations. Elvis proposes traditional dancehall steps andbrings it into a modern context. Dance fitness program from South America – Zumba involves dance and aerobic movements performed to energetic music. The choreography incorporates hip-hop, samba, salsa, merengue and mambo. 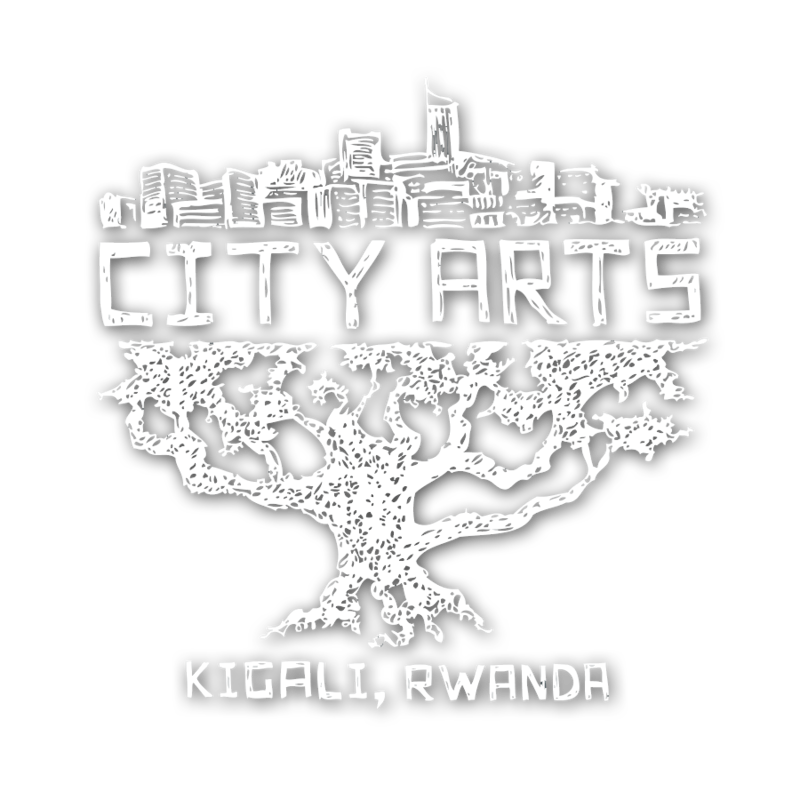 Monthly fee: 15,000 RwF or Drop-in price 5,000 RwF. One night you go to the Latino social dance (shows), you fall in love with it, you wonder whether you can ever find yourself on the dance floor but still don’t know what to do once you get there. Have you ever dreamed of becoming a good Latino dancer? Come and join the very first class of salsa, bachata, kizomba, semba, chacha, merengue on, one on one with the best instructors in town (Amigo Kassim & Rabbil). Join the first in take that is limited to 30 people, don’t miss it as you’ll have to wait another month to start! Discover different African dances – Our Congolese Teacher, Lucas, is a master of Ndombolo and an experimented African modern dancer as a soloist, in regional dance festivals or as a choreographer. With him, you will enjoy discovering dances from different parts of the continent. Tap is a unique style of dance that primarily involves the use of the feet (ideally wearing tap shoes fitted with metal taps on the bottoms) to create different tones and rhythms. It is much like playing a percussion instrument, but with more physicality and performance quality. Find your inner groove and join us for a full body jam session! Nina offers for all beginners who are attending the Tap class an introduction class, just half an hour before the Tap class. The introduction class is included in the Tap class fee. For adults and kids (> 7 years). Modern/contemporary dance covers a broad spectrum of movement possibilities. It is letting go of old rules, exploring natural flow, and challenging personal limits in motion and creative thinking. Release your stresses, press into your inner strength, and discover a way to activate both body and mind.